Soccer fans like beer. Lots of it. So it was a big problem when a packed house of soccer fans was unable to pay for food and drinks during Great Britain's first Olympics match. Fans attending the match against the United Arab Emirates at Wembley were left in the cold when Wembley inexplicably stopped accepting card payments from the only credit card available for usage due to its ~$100M sponsorship. 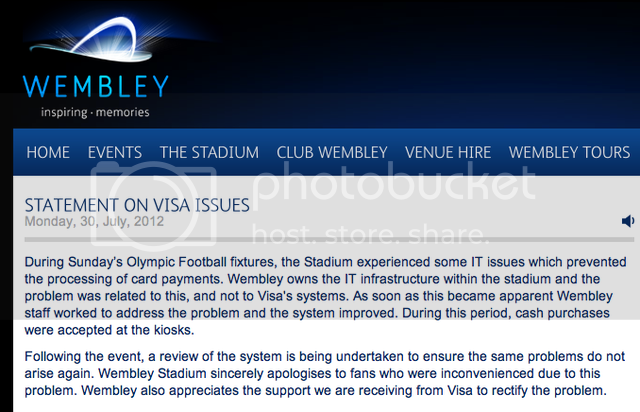 On its website, Wembley last night issued this statement. Much of the damage, however, was already done as many fans have taken to Twitter to pass obvious jokes and blame IOC sponsor, Visa: Visa + Wembley.